If you live in the Midwest and don't yet have any big plans for the weekend, may we suggest shopping for an even warmer winter coat, or better yet, booking a last-minute vacation somewhere warm? It looks like next week is going to wallop a huge part of the northern US with one hell of of an Arctic blast, and it has the potential to deliver "life-threatening" and record-low temperatures across the Midwest and Great Lakes. In a brutal follow-up to the frigid temperatures that've already descended upon parts of the upper Midwest, the National Weather Service warned Friday that the coldest air so far this season will blast through the the area next week, the product of a one-two punch from the polar vortex. The worst of the blast will be felt in the upper Midwest, though exceedingly chilly temperatures are expected to stretch further east and as far south as Florida, meaning this bout of chilliness could potentially affect up to 200 million people, per USA Today. In terms of when exactly this is happening, forecasting models show slightly different timelines. However, it's safe to assume the cold will be most extreme between Tuesday and Thursday. 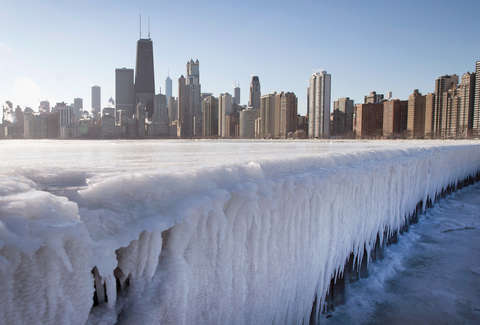 It's still too early to know just how bad it'll be, but according to at least one model, wind chill temperatures could drop to as low minus 50 to minus 60 degrees Fahrenheit in areas stretching from Chicago to Minneapolis, according to The Washington Post. And even the most optimistic models right show it's going to be insanely chilly, with temperatures ranging from 15 to 30 degrees below normal for this time of year. In any case, it's likely that cities like Minneapolis, Des Moines, Chicago, and Detroit and surrounding large stretches in between them will wake up to subzero temps by Wednesday, and many won't get above zero all day. This latest blast of cold is all thanks to a southward plunge of the polar vortex, which split into chunks earlier this month due to a rapid warmth of the stratosphere over the Arctic. That's since set into motion a series of extreme and unusually cold weather events. The dangerous cold next week should only last between two and three days, as it eventually lessens in intensity and moves east toward New England. Though if it's as bad as it's predicted to be, everyone from the Dakotas to Maine should prepare for a week of wearing multiple sweaters at once.